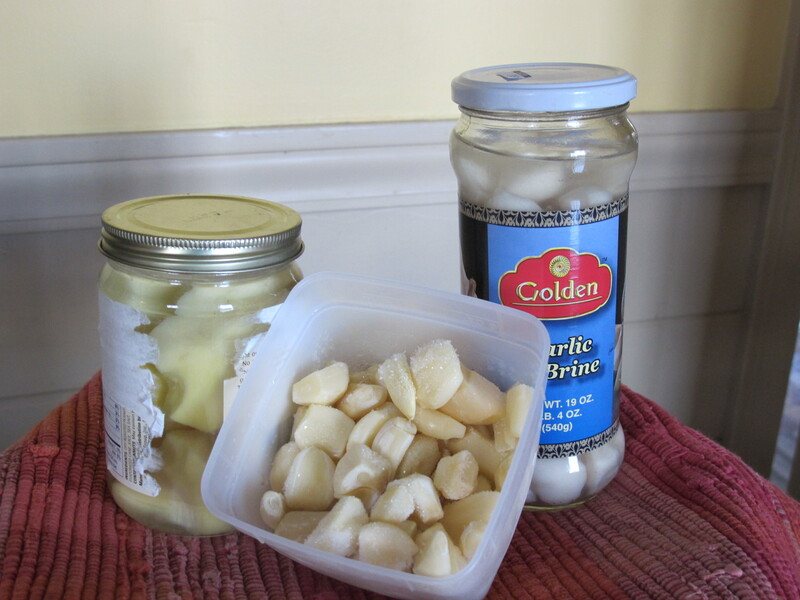 Here is a quick way to have fresh garlic and ginger on hand when you need them. For garlic, I use garlic I’ve grown, peeled and stored in dry white wine in the fridge. This takes just seconds to mince and toss into the mix. You can also buy garlic at the farmer’s market when it is fresh–and cheap–in July. Look for excess California grown garlic in your supermarket at the same time. Peel and freeze. I replenish my fridge jar with the stuff from my freezer. You can also buy peeled garlic cloves, but don’t get the stuff they’ve de-odorized and is intended for an appetizer. Ginger also keeps well in a jar of rice wine. Peel thumb-sized pieces. They stay fresh almost indefinitely and are ready for me whenever I need them.